It was taken by John Driscoll in 1976 at the Walker Art Center during a set-up of Rainforest IV. Jumping over the original meaning and the basic principle behind Rainforest IV, my mind started to imagine myself inside that oil drum, and to project an interactive sound installation “for solo performer”. My first idea was to replace the electromechnaical trasducer used by David Tudor with common electromagnetic dirivers reclaimed from old stereo loudspeakers, treated gluing a cork with a small screw to the center of the loudspeakers. I-O is composed by an oil-drum hanging from the ceiling, 8 trated loudspeakers held on the drum metal surface, a stereo amplifier, a computer, an Arduino board and an handmade sound controller. Audience members can interact one by one with the installation using the handmade controller, turning up and down volume and frequency of the computer audio signal (a sinusoid cluster) by means of two potentiometers. 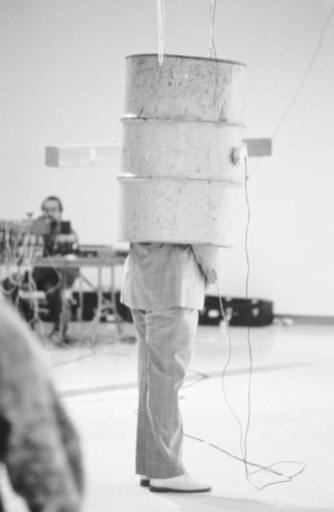 The aim of I-O is to provide audience members with a personal, intimate and physical sound experience, isolating the “solo performer” inside the vibrating oil drum, limiting his/her eyesight and empowering his/her listening conditions. 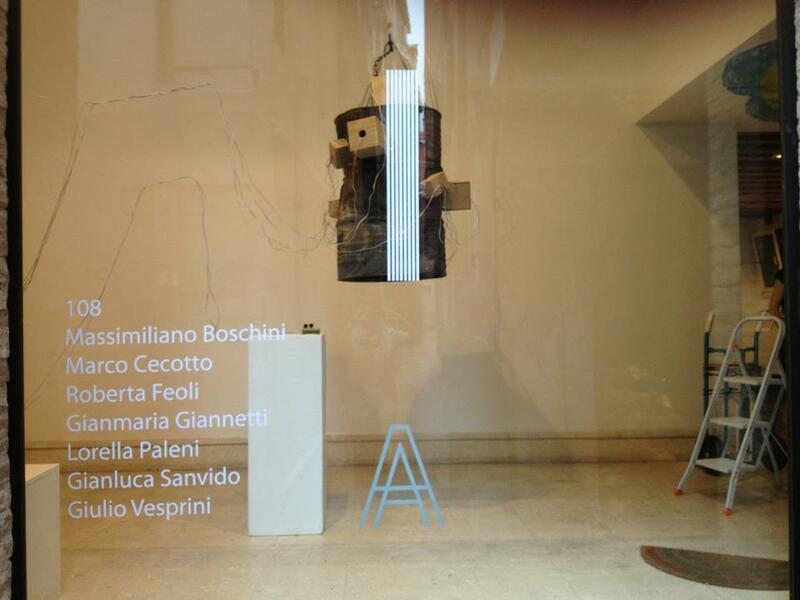 It was setted up for the first time for “I”, the first No Title Gallery collective event in Venice, at the Slovenian Exhibition Center AplusA.